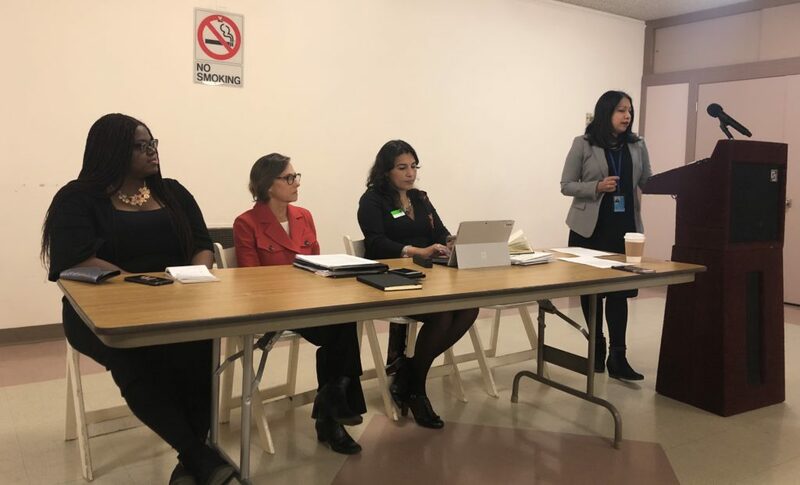 IANGEL took an active role at CSW 63. We presented a parallel side event on this year’s theme, “How Volunteer Lawyers Support Efforts Advocating for Equality in Social Protections”. The esteemed panelists included Lizetta Robleto de Howarth of the Law Society of England and Wales, Olaoluwa Abagun from Girl Pride Circle, Nigeria, IANGEL Executive Director Andrea Carlise and IANGEL Board Member and Professor Shruti Rana. The panel highlighted work being done across multiple continents, including IANGEL’s trainings for volunteer lawyers to address the legal needs of victims of human trafficking, providing legal information for greater access to reproductive health services, and examining the role lawyers can play to advance gender equality. Especially moving was Ms. Abagun’s presentation on barriers to justice faced by survivors of sexual assault in Nigeria. Her remarks included the poignant observations that we must not forget that “lawyers are social engineers” and the law is a “noble profession”. IANGEL participated in the panel for the event “On the Margins: Robust and Independent Judicial and Legal Institutions As A Way of Addressing Women’s Empowerment,” hosted by the National Alliance of Women’s Organizations (NAWO) and the Law Society of England and Wales. This dynamic discussion highlighted the need for more women at the table as a way to address inequalities in the workplace for women around the world. Christina Blacklaws, President of the Law Society of England and Wales noted that women perceive unconscious bias as the biggest hurdle to workplace equality; Tazeen Hassan, Senior Private Sector Development Specialist from the World Bank, shared the 2019 findings from the World Bank Women, Business and the Law report; and Ms. Andrea Carlise offered examples from the United States about the need for paid family leave to ensure women’s ability to fully engage in the workplace. Likewise, Professor Shruti Rana was a panelist for the parallel event “On the Margins: Is Current Governance Infrastructure, Including the Judicial and Legal System, Delivering for Women and Girls?” hosted by NAWO and the Law Society of England and Wales. Professor Rana documented the rising threats to global governance and weakening equality protections by sharing three examples from the United States: the rollback of asylum protections for women fleeing gender-based violence, the elevation of Brett Kavanaugh to the Supreme Court, and family separations at the U.S.-Mexico border. Professor Rana highlighted the need for systems to monitor the “watchers” of legal policy and jurisprudence as equality under the law is threatened in the United States. Additionally, IANGEL also hosted a Women and the Law Roundtable presented by the Law Society of England and Wales at the beautiful NYC office of Kelley, Drye & Warren LLP. This was a powerful discussion of the issues women face in the legal sector around the world. Topics included unconscious bias, the gender pay gap, mentorship, and barriers to career advancement. The roundtable was an engaging event that left the delegation feeling enlightened and inspired. Being a part of an exciting gathering of women’s rights advocates like CSW, was an opportunity for IANGEL to promote its own values of using pro-bono legal work to advance gender justice and also to be a part of a greater dialogue understanding the challenges, achievements, and practices on gender issues around the globe.